By Brian Hoey. Aug 9, 2017. 9:00 AM. The great English poets of the 17th century did not always fare especially well. John Milton, following the Restoration in May 1660, had to go into hiding until a royal pardon was issued exonerating him for the civic and poetic work he did during Oliver Cromwell’s reign (some of his poems in that era were seen as condoning Cromwell’s regicide of King Charles I). Even after the pardon was issued, Milton found himself imprisoned until Andrew Marvell convinced the monarchy not to execute him. Marvell himself, another poetic luminary of the era, had only narrowly avoided prison himself on the occasion of the Restoration. 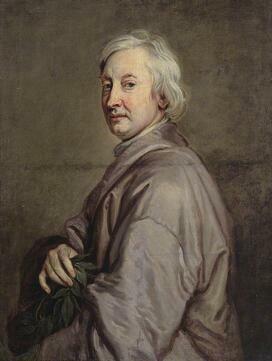 John Dryden, too, managed to escape the wrath of the restored monarchy, but a few decades later the Glorious Revolution would find him less fortunate. After he refused to swear the oaths of allegiance to newly-crowned protestant monarchs William and Mary, he lost his position as Poet Laureate and the comforts of a position at court. Dryden, for his part, was one of the most important writers of his era. Not only was he an important writer of verse (helping bring into favor the heroic couplets for which Alexander Pope would later become renowned), he was also a beloved dramatist, spearheading the influx of Restoration comedies, and an expert translator of classical literary works like Virgil's Aeneid (19 B.C.) and Ovid’s Metamorphoses (8 A.D.). Following the publication of his poem "Annus Mirabilis" (1667), which focused on the Great Fire of London and the English military travails of that year, he was made England’s first official Poet Laureate (i.e. the first Poet Laureate who was granted an official position at court). During his tenure at court, Dryden would write one of his most famous satirical poems, "Mac Flecknoe" (1682), which was directed at the allegedly Ben Jonson-worshipping hack writer Thomas Shadwell (“The rest to some faint meaning make pretence,/But Shadwell never deviates into sense,” goes one of its more biting lines). When the Glorious Revolution came around and Dryden lost his position, it was Shadwell who was given his old position as Poet Laureate. One has to imagine that it was meant to be taken personally. 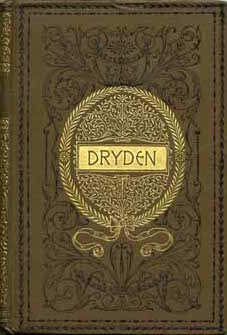 While Dryden died embittered and in constant dispute with his publishers, he is still remembered as one of his century’s best English writers. His (and Milton’s) life, however, should be seen as a powerful parable for making art in the 21st century. From the Romantic Poets through the Iowa Writers’ Workshop, we’ve spent hundreds of years considering the appropriate separation between writing and the political. Often we've decided that the two should be as segregated as possible. This separation may seem easy enough for writers with a certain class status who can insulate themselves from the meat of political struggles, but Milton and Dryden serve to remind us that there will be times when the political will become inescapable; when it will become necessary to choose a side and stand with it, and one’s writing will almost necessarily reflect that choice—as Dryden’s and Milton’s did. While the political character of Milton’s writing was comparatively oblique (baked, as it was, into the allegorical nature of Paradise Lost (1667)), Dryden’s poetry, which included a number of panegyrics, often dealt plainly and explicitly with the events of the day, including Cromwell’s deposition, about which he seemed famously ambivalent. Both were valid and historically validated routes, and today few people quibble about the actual politics contained therein, but the political turmoil of the 17th century made it necessary to walk one or the other path. There may have been periods in history where it really was possible to keep one’s political and artistic selves separate, but we have to ask ourselves, how likely is it that the Trump-Brexit era will be one of those periods? If we’re erring on the side of ‘not very likely,’ then we would do well to keep Dryden in mind.